NEW YORK–(BUSINESS WIRE)–Christie’s, the world’s leading art business, announces it will pilot encrypted registration of art transactions on a blockchain this fall, as part of a unique collaboration with Artory, a leading independent digital registry for the art market. In an industry first, each artwork from An American Place: The Barney A. Ebsworth Collection sold at Christie’s this November will include a secure, encrypted certification of the sale for the successful bidder, providing a permanent digital record of relevant information about the artwork. This announcement of the blockchain collaboration is timed to Christie’s upcoming West Coast tour of major artworks from the Barney A. Ebsworth Collection, widely recognized as the most important privately-held collection of 20th Century American Art. It is estimated to exceed $300 million total at auction. 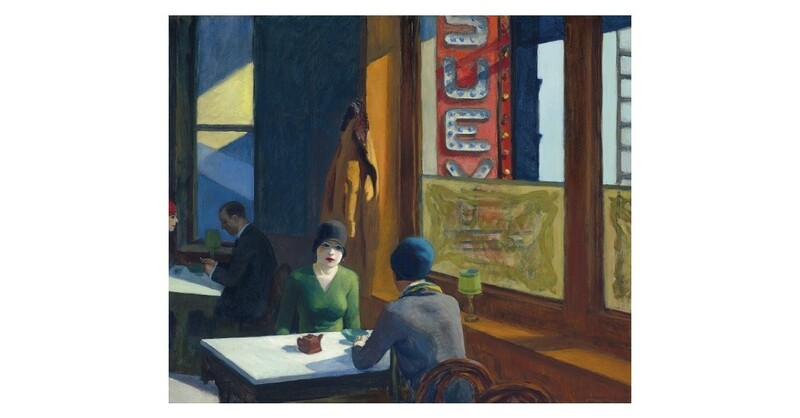 Led by Chop Suey, Edward Hopper’s singular masterpiece of American Modernism (pictured above), Christie’s will tour 13 paintings from the collection of more than 90 individual works to San Francisco and Los Angeles for public exhibitions. Among the featured paintings in the exhibitions are rarely-seen works by the most important American artists of the modern era: Jackson Pollock, Willem de Kooning, Georgia O’Keeffe, Jasper Johns, Marsden Hartley, and Charles Sheeler, among others. The exhibitions are open to the public in San Francisco at Minnesota Street Gallery October 16 – 20, and in Los Angeles at Christie’s flagship Beverly Hills Gallery October 23 – 27. Full details and additional highlights are noted below. The introduction of a blockchain encryption component to the collection sale reflects Barney Ebsworth’s own commitment to innovation in business, and his embrace of technology as a powerful tool to advance efficiency and improve the client experience. During his lifetime, Mr. Ebsworth was founder of the Clipper Cruise Line, the luxury travel provider Intrav, and later became a venture capital and real estate investor. Of his own career as a business entrepreneur, Mr. Ebsworth said “my tendency to stay ahead of the curve and reinvent the business as needed” is one of the primary qualities that made him successful in business. Blockchain technology works by registering significant events that take place in the lifecycle of an artwork, such as a public exhibition or sale at auction. For the Christie’s collaboration with Artory, the Artory blockchain registry will securely record all public information regarding the sale of each lot in the Ebsworth Collection, including title, description, final price, and date, and produce a digital certificate of the transaction for Christie’s. After the auction, Christie’s will offer each buyer a registration card to access a secure encrypted record of information about their purchased artwork on the Artory Registry. Each buyer retains individual control of their personal information throughout the transaction process; Artory does not collect any personal information about buyers, and no personal information is recorded in their Registry or on the blockchain. The West Coast tours of highlights from the Ebsworth Collection are a continuation of a global tour that launched in Paris in September and continued to Hong Kong and London. In addition to Hopper’s Chop Suey, the Los Angeles exhibition reveals new highlights from the Collection, including Jasper Johns’s Gray Rectangles (estimate: $20-30 million) formerly owned by the celebrated New York collectors Victor and Sally Ganz; and Horn and Feather by Georgia O’Keeffe, a close friend of Mr. Ebsworth (estimate: $700,000-1,000,000). In San Francisco, Christie’s will reveal two paintings with storied provenance: Willem de Kooning’s Woman as Landscape, previously owned by comedian and collector Steve Martin (estimate in the region of $60 million); and Franz Kline’s, Painting from 1954, once owned by the American artist Joan Mitchell (estimate: $5-7 million). Mitchell’s own 12 Hawks at 3 O’Clock, (estimate: $12-16 million), a near 10-foot tall tour-de-force painted in 1960, is among the highlights of the Ebsworth Collection. The full Collection will be unveiled to the public in an extended exhibition from November 4 -13 at Christie’s galleries in Rockefeller Center, New York. This pilot continues a long Christie’s legacy of leading the industry by introducing technology innovations in the context of major collections, for the ultimate benefit of our clients. Over the years, new technological enhancements have included online bidding in live auctions, live streaming, e-commerce auctions, mobile bidding registration, augmented reality apps, and more. Christie’s pioneered online-only e-commerce auctions with The Collection of Elizabeth Taylor in 2011 and multi-platform, multi-year collection sales (live auction, online, and private sales) with Andy [email protected]’s, sold to benefit the Andy Warhol Foundation for the Visual Arts.